This was a piece of cake to setup. I had it running in minutes. But, having speeds advertised at 200Mbps, I was very disappointed to see that my speeds average in the low 20Mbps range. I wanted to use this to connect my home theater PC to the rest of my network to share media. This device gets the job done- but barely. If it were much slower, streaming video would be a real problem. I experimented and tried it with the two devices closer together- I got around 30Mbps. At no point did I get anything even remotely approaching 100Mbps (which would be the limit of fast ethernet). I have problems with WiFi in my home, even using NetGear's RangeMax Wireless N, so I thought I'd try the new PowerLine AV ethernet. Similar LinkSys products using the new PowerLine AV standard were getting good reviews, but I spotted a sale on Trendnet's product at Amazon for $66. I already had a Trendnet Keyboard/Video/Audio adapter and the quality was excellent, so I thought I'd give this a try. Pros: It's easy and it works extremely well; just plug in one adapter near the router and the other where you want the extension. 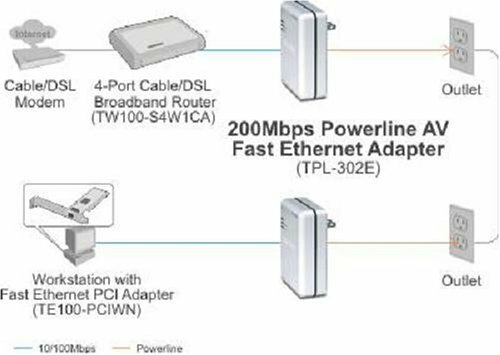 Use the network cables supplied to connect one to your router, and the other to your remote PC, give it all a few seconds to sync up, and voila, instant LAN with no dropouts! Three year warranty, to boot. It should be noted that all the outlets I use are tied in to circuits on the same breaker panel (though not the same breaker.) Some things I've read indicate that that's important for getting a good result. I bought these (away from Amazon) for about a 65% off list price. I thought great, will keep me from getting in the attic. Setup was easy and I was accessing my network without any issues. This device will work great if all you want is an internet (less than 15mbs) connection in a remote location. For my use (streaming HD .tp streams from one PC to another) this device fell too far below it's advertised 200mbps. In rooms less than 15 feet away from my router it was like a wired connection. Much further than that and it was just a little better than a 'g' wireless router with rates in the 34mbps range (according to its utility). If you are looking for some way to easily move around your internet connection and your house is relatively small this should work. If you want to stream videos, the hard wire in the wall is the only way to go. Once they're up and running, they are great, but are somewhat complicated to setup. I bought these a while back, and I couldn't set them up. So I left them sitting in my room until I got convinced of giving them a second try. So, I did. The outcome was great. For non-IT people; you'll actually have to read the instructions really slow!! Take your time and go through them over at least 2 times before attempting to install. Like I said, these two work great!! I think that if you can get them and have patience to read instructions and install computer stuff, then you should be just fine. The Windows client is rudimentary but it works. There's apparently no encryption config menu option like Netgear's competing product, so we just have to trust in the marketing spiel "128-bit AES". Too bad there's no control client for Macs, I had to configure the pair using VMWare Fusion running Windows in bridged network mode. But once I plugged in the first one and set a network ID, then plug in the upstairs one and set the same network ID, I was on the 'net in no time. I do hear a weird high-pitched noise emanating from it, but otherwise it's been a quick setup. If your house doesn't have a matrix of complex traffic for electrical circuit-breakers, then this should work quickly. Got this under the Goldbox deal and also had a giftcard so was really cheap! Was skeptical at first as to how well it would work, setup took about 5 minutes, plugged and in I was all set! This device allows me to put my VoIP adapter in the living room so I can have a phone jack there and also connect my Dish Network Receiver and save $5 a month! Ready to buy again when the price drops to around 75.